A debug location in source code, used for debug info and otherwise. Definition at line 1402 of file DebugInfoMetadata.h. Definition at line 1634 of file DebugInfoMetadata.h. Returns a new DILocation with duplication factor DF * current duplication factor encoded in the discriminator. The current duplication factor is as defined by getDuplicationFactor(). Returns None if encoding failed. Definition at line 2056 of file DebugInfoMetadata.h. Only the base discriminator is set in the new DILocation, the other encoded values are elided. If the discriminator cannot be encoded, the function returns None. Definition at line 2046 of file DebugInfoMetadata.h. Definition at line 2018 of file DebugInfoMetadata.h. References llvm::dyn_cast(), llvm::MDNode::get(), and llvm::DIScope::getScope(). Raw decoder for values in an encoded discriminator D.
Definition at line 149 of file DebugInfoMetadata.cpp. Raw encoding of the discriminator. APIs such as cloneWithDuplicationFactor have certain special case behavior (e.g. treating empty duplication factor as the value '1'). This API, in conjunction with cloneWithDiscriminator, may be used to encode the raw values provided. BD: base discriminator DF: duplication factor CI: copy index The return is None if the values cannot be encoded in 32 bits - for example, values for BD or DF larger than 12 bits. Otherwise, the return is the encoded value. Definition at line 117 of file DebugInfoMetadata.cpp. References llvm::SmallVectorTemplateCommon< T, typename >::begin(), C, decodeDiscriminator(), llvm::SmallVectorTemplateCommon< T, typename >::end(), I, llvm::None, and llvm::MipsISD::Ret. Definition at line 2034 of file DebugInfoMetadata.h. Referenced by callsiteIsHot(), llvm::sampleprof::FunctionSamples::findFunctionSamples(), and SortCallTargets(). Returns the base discriminator for a given encoded discriminator D.
Definition at line 1591 of file DebugInfoMetadata.h. Returns the copy identifier stored in the discriminator. Definition at line 2042 of file DebugInfoMetadata.h. Returns the copy identifier for a given encoded discriminator D.
Definition at line 1621 of file DebugInfoMetadata.h. Returns the duplication factor stored in the discriminator, or 1 if no duplication factor (or 0) is encoded. Definition at line 2038 of file DebugInfoMetadata.h. Returns the duplication factor for a given encoded discriminator D, or 1 if no value or 0 is encoded. Definition at line 1612 of file DebugInfoMetadata.h. When two instructions are combined into a single instruction we also need to combine the original locations into a single location. When the locations are the same we can use either location. When they differ, we need a third location which is distinct from either. If they have the same file/line but have a different discriminator we could create a location with a new discriminator. If they are from different files/lines the location is ambiguous and can't be represented in a line entry. 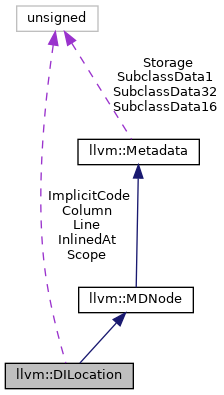 In this case, if GenerateLocation is true, we will set the merged debug location as line 0 of the nearest common scope where the two locations are inlined from. GenerateLocation: Whether the merged location can be generated when LocA and LocB differ. Definition at line 75 of file DebugInfoMetadata.cpp. References llvm::SmallSet< T, N, C >::count(), llvm::MDNode::get(), llvm::MDNode::getContext(), llvm::DIScope::getScope(), llvm::SmallSet< T, N, C >::insert(), llvm::SmallPtrSetImpl< PtrType >::insert(), and llvm::TypedDINodeRef< T >::resolve(). Referenced by llvm::Instruction::applyMergedLocation(), llvm::MachineBasicBlock::findBranchDebugLoc(), mergeOperations(), performSink(), updateOperand(), and llvm::InstCombiner::visitStoreInst(). Definition at line 1628 of file DebugInfoMetadata.h. Referenced by isDINode(), and llvm::MDNodeKeyImpl< DILocation >::isKeyOf(). Definition at line 1627 of file DebugInfoMetadata.h. Referenced by getSubprogram(), getSuccPad(), isDINode(), and llvm::MDNodeKeyImpl< DILocation >::isKeyOf(). Definition at line 1403 of file DebugInfoMetadata.h. Definition at line 1404 of file DebugInfoMetadata.h. Definition at line 1472 of file DebugInfoMetadata.h. Definition at line 1474 of file DebugInfoMetadata.h. Definition at line 1473 of file DebugInfoMetadata.h. Referenced by llvm::DICompositeType::buildODRType(), llvm::DIBasicType::getSignedness(), llvm::DIVariable::getSizeInBits(), llvm::DIExpression::isConstant(), and llvm::DISubprogram::splitFlags().